Pieris is the Tax & Legal Practice Leader of Deloitte in Cyprus. His experience includes many tax planning projects for major multinationals, private and local entities operating in Cyprus and has many years of experience in both local and international tax planning and restructuring. Pieris holds a BA in Accounting from a UK university, is a fellow member of the Institute of Chartered Accountants in England and Wales and a member of the Chartered Institute of Taxation. 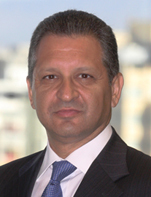 He is an active member of the Institute of Certified Public Accountants of Cyprus since 1992, having served as member, vice chairman and chairman of the Tax and VAT Committees of the Institute and is currently a member of the Institute's Council. He participates in a number of meetings at the Ministry of Finance, the House of Representatives and with the Tax Commissioner for the formulation of the Government's policies on taxation and is a member of an advisory committee to the Government on treaty negotiations. Pieris specializes in local and international taxation, is a speaker at many conferences and an author of many articles both in the local financial press as well as international tax journals.